The two sisters behind Four Idle Hands bring you behind-the-scenes info about us and our artsy business plus a heads-up on artists, illustrators, crafters, designers, products we love, and anything else we think qualifies for the designation of Devilishly Good Stuff! We're teaming up with Renegade Craft Fair again! 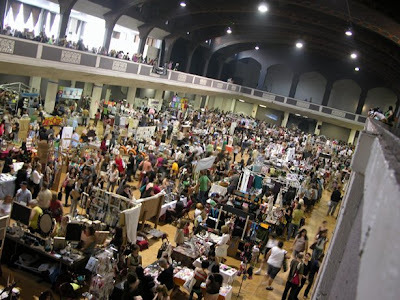 SORR will take place on the first day of the 2-day craft fair on Saturday, July 16th, from 12 pm to 5 pm. Swap-O-Rama-Rama is a super fun clothing exchange event and series of DIY workshops where participants explore creative reuse from recycled clothing. 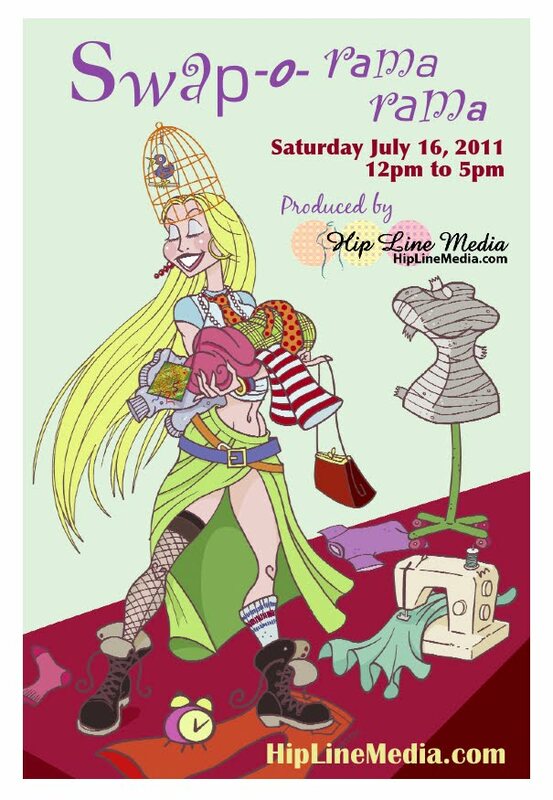 Clean out your closet and bring a bag of clean, gently used, unwanted clothes. Everyone's contributions are sorted and put out on tables where you can pick new-to-you pieces. Take your "new" finds to a sewing or embellishment station to transform them! Designers with sewing machines will be available to help you with ideas and construction. Take home all the clothes you can carry! This is always a fun event and the best part is we're recycling, reducing and reusing. Unfortunately I won't be silkscreening this year because space is tight and we don't have access to running water but I'll be there helping with other stations. We're still looking for volunteers too so please contact Lori if you can help. You read that right, the infamous BUST Magazine Holiday Craftacular has finally made it to Los Angeles and we're beyond excited to be participating as a vendor! It's only 3 days away.... Saturday, December 6th, at the Echoplex. If you'll be there please look us up in booth number 43. Felt Club + Swap-O-Rama-Rama = Super Happy Fun Time! Thanks to everyone who came out to see us at Felt Club on Sunday the 16th! Hopefully you all had as much fun as we did. This event just gets bigger and better every year. Lots of people were much more *ahem* timely with their posts so I'm just going to give you some good links in case you're interested in a post-game wrap-up. Swap-O-Rama-Rama photos are here in the official Swap LA flickr group. Please add your photos to the group, we'd love to see them! Here's a wrap-up from Swap organizer Lori at Hip Line Media. She has links to some of the terrific designers who worked at this Swap so be sure to check them out. Great article about Felt Club & Swap in the LA Times. Stephanie Girard, of Sweater Surgery fame, has some great Felt Club photos over at Craftside. Nice Felt Club/Swap slideshow over at Metromix. 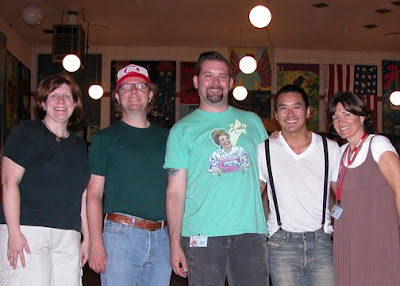 Heidi from My Paper Crane has a little wrap-up and some great photos. The one of her with Leslie Hall is so awesome! .......is talk about Felt Club! Lots of great stuff happening behind the scenes in preparation for this year's Holiday Felt Club. It has doubled in size with approximately 150 vendors and is being held at the Shrine Expo Center. Don't forget, Swap-O-Rama-Rama will be there too and we're still looking for volunteers. Contact Lori if you can help! We've got tons of web banners up so please help us spread the word and put one of these little beauties on your blog or web site. It would be ever-so-nice of you and we'll be your best friend forever! 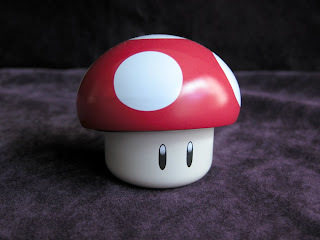 Found this adorable little Mario mushroom at Cost Plus the other day and couldn't resist getting it. We're going through a serious Mario Kart (Wii) addiction lately so we seem to be noticing Mario stuff everywhere. And the songs keep getting stuck in my head. Maybe I need to scale it back a bit. Right after I finish up the Mirrored tracks, I swear! It's that time crafty friends! Time for Felt Club! Hooray! Applications are now being accepted through the web site and you only have until August 22nd to get yours submitted. As always you *can* share a table with a friend but the cost goes up a bit to $100 per person. 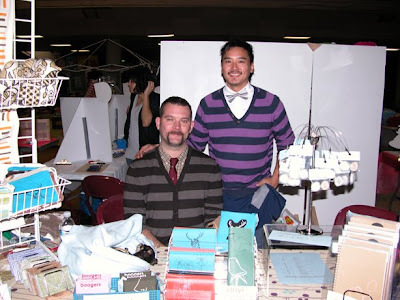 Felt Club's Holiday 2008 event is being held Sunday, November 16 at the beautiful Shrine Auditorium Expo Center and it's going to be a blast! It will be the usual melange of great music, your favorite vendors, crafty workshops and this year Swap-O-Rama-Rama has been added. Keep checking back for more info as it becomes available but the important thing right now is to apply! Go, do it now, you know you want to. Holy Cow did we have fun at Swap-O-Rama-Rama! The above photo of our core group of organizers was taken after a long, hectic but awesome day of sewing, screening, and swapping. Lori Petitti (far right) has organizational skills like you wouldn't believe and produced another awesome show. On top of which she manned a sewing station all day! Everyone really got into the spirit of the event and helped each other work on projects, find clothes and come up with ideas for altering and embellishing their finds. One of the rules for SORR is no mirrors which is to encourage people to interact with one another and ask someone else for their opinion. I have to say it definitely worked! There was a lot of teaching and helping going on among participants at the sewing stations too and that's exactly how it's supposed to happen. We've got another one coming up in November so keep checking back for details and I'll hope to see you there! 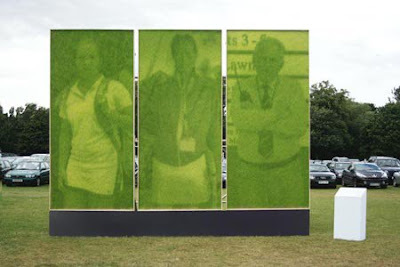 Here's a photo from flickr user bowdie of some other grass images they created. Brilliant! Just a reminder that Swap-O-Rama-Rama is coming up this Saturday (ack! So much to do!) 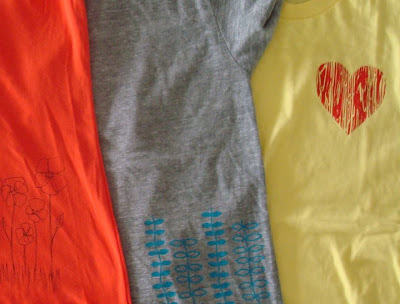 and a little peek at someone's designs for the silkscreening station. I hope you can join us, it's going to be a lot of fun! I saw a brilliant idea in the summer issue of The Nest magazine. Yes, I know the magazine is aimed at newlyweds but I didn't realize that when I signed up for my free trial subscription. heh It just goes to show you never know where you'll find ideas that will strike a chord with you. And my husband found a recipe or two that he'd like to try, so it's definitely useful. (Am I sounding defensive? ha ha) Anyway they did a feature with the owners of an online store called The Curiosity Shoppe, which carries some really cute things by the way. 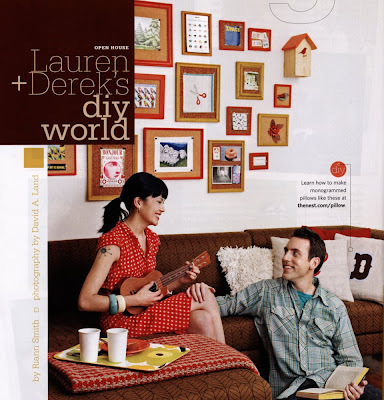 Come to find out these two are the Derek & Lauren of Design Sponge DIY Wednesdays fame. So The Nest showed many lovely photos of their apartment and mentioned the above pictured wall covered with photo frames which have cork in them. The suggestion in the magazine is to "Buy frames from a thrift store, spray paint them bold colors, pop out the glass and cut the cork to fit the rectangle." Ingenius says I! You could just switch out the artwork or photos whenever you wanted. I especially like this idea for use as an inspiration board in my office. Much better than a traditional rectangular bulletin board. Vive Le France! and Thailand Too! 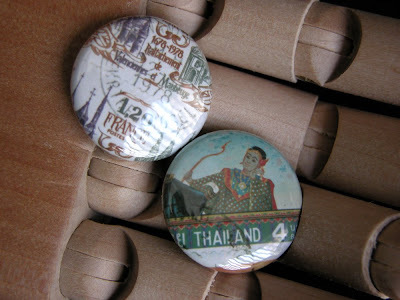 We have some new 1" pin-back buttons in the Etsy store. This is the start of a new series showing canceled stamps taken from our childhood collection dating back to the 1970's. Unfortunately the stamp collecting bug didn't stick but we've always loved the look of some of these older stamps that our Maman exceptionnel snagged for us when she worked at the geological society. I received my Moo Card prize package (which I won through the Illustration Friday blog back in February) a couple weeks ago and finally have photographs to share. I'm extremely impressed with everything! The Moo MiniCards are really adorable, with a beautiful satin finish, and I think they generate extra interest because of the unusual size. The stickers are gorgeous and really, really shiny which I like. The only thing I didn't like, and I'm sure it's my own fault, is that multiples of the same image weren't grouped together on one page when printed. I wanted 6 of the same image on each sticker page so that I could tear out pages and give them to people but they were all interspersed and distributed randomly throughout the 15 pages. I'm sure there's something I should have done when ordering that would have fixed this. The postcards are nicely done and the colors came out just as I had hoped. I have to say the MiniCards printed a tad darker than I would have liked, which I have heard before from others, but now that I've seen it firsthand I'll just adjust for it in the files I submit in the future. I was also going to say that one drawback of getting so many different images is that it was a little time consuming to pick them out and get them uploaded. However, my husband pointed out that I'm a hopeless perfectionist and a normal person wouldn't have had to spend so much time on it. heh. Final verdict: these Moo products look fabulous and are reasonably priced. I'm going to be ordering more very soon. 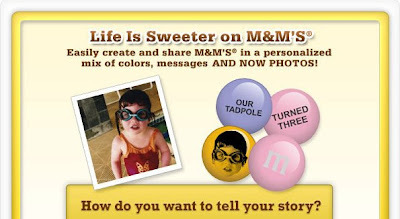 Not only are they perfect for self-promotion efforts but I'm thinking of all kinds of gift ideas now. 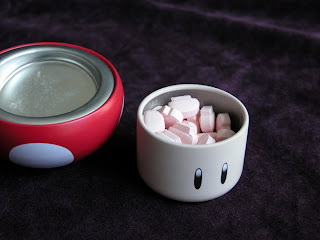 You may remember that last year I started writing for the Craft Tutorials blog. It's changed hands a couple of times since then and now has a new home at crafttutorials.net. Vernon is doing a great job of getting things all spruced up and adding new content. Don't forget to change your bookmarks to the new address and also swing by the flickr pool to see what everyone's making. Last Tuesday Lori and I attended the Los Angeles Craft Mafia's monthly meeting in Venice to see what they were up to and spread the word about Swap-O-Rama-Rama. Founders Nichole and Morgan were super-nice and are doing a great job facilitating some crafty togetherness. They have a blog and an Etsy store and are planning to do some craft shows too. The guest-crafter for this particular meeting was Sonya Nimri who showed everyone how to make cute bracelets and necklaces by hand-twisting beads onto wire. Sonya manned one of the designer sewing stations at the last LA SORR and she'll be helping us out again in June. She also has a book out called Beadalicious and it looks really fun. Nice to see the Craft Mafia finally make it to Los Angeles!